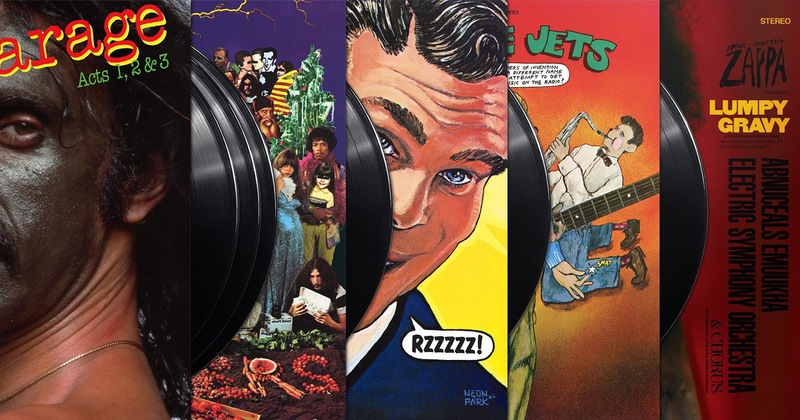 Discussions Magazine Music Blog: Joe’s Montage: The FRANK ZAPPA Vinyl Reissues! Joe’s Montage: The FRANK ZAPPA Vinyl Reissues! Zappa Records and UMe have teamed together for yet another monumental wave of Frank Zappa/Mothers of Invention releases, all available on vinyl again for the first time in decades! 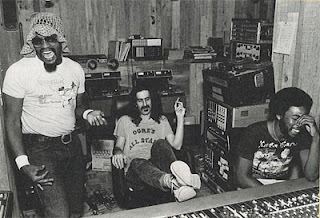 Following November’s highly-anticipated new offerings of MEAT LIGHT, CHICAGO ’78 and LITTLE DOTS, five core catalog titles were immediately announced to follow as part of the Zappa Family Trust’s continued excavation of the storied music vault. The five titles given new analog life include CRUISING WITH RUBEN & THE JETS (the fourth Mothers of Invention album, released in 1968), JOE’S GARAGE (all three Acts, from 1979), LUMPY GRAVY (Frank’s first solo album from 1967), WEASELS RIPPED MY FLESH (the last album from the original Mothers lineup, 1970), and WE’RE ONLY IN IT FOR THE MONEY (the 1968 political satire classic, complete with a Beatles parody cover). Each of these records stands on their own as essential listening among Zappa aficionados. Although they don’t paint the complete picture of his range and diversity, they all coalesce as a well-defined denominator to Frank’s immense catalog. The humor. The innovation. The culture. The nerve. The genius. It’s all there. 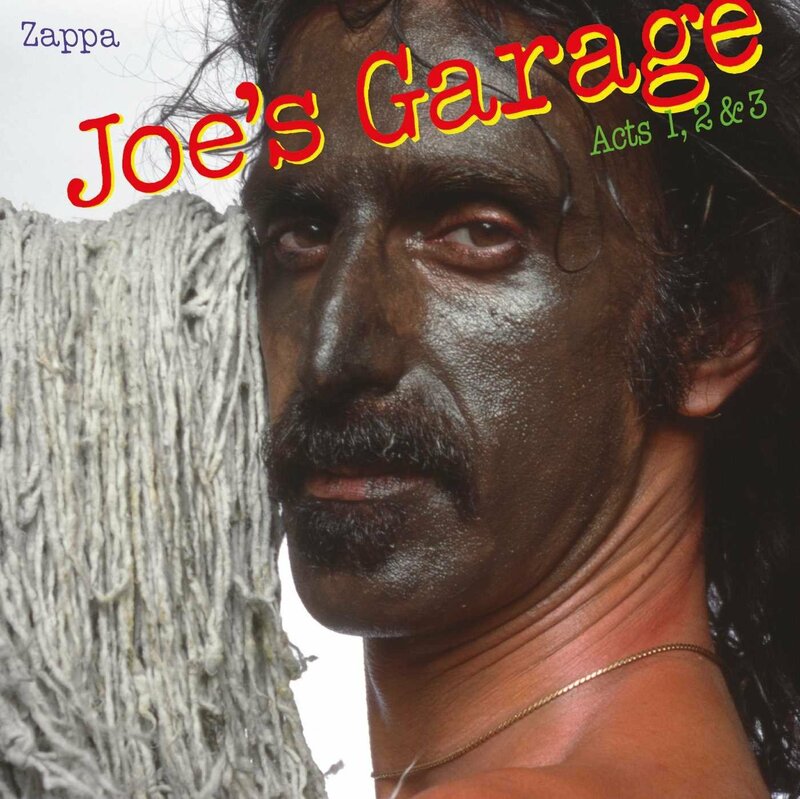 Of the reissues just unleashed, JOE’S GARAGE is perhaps the most alluring to both casual listeners and those that have already jumped in the deep end of Zappa’s catalog. There’s always something to keep coming back for. Originally issued as two separate pieces (Act 1 was released in September of 1979 with Acts 2 & 3 being issued together two months later), it wasn’t until 1987 that Barking Pumpkin Records (A Frank Zappa label) issued all three acts together as one cohesive piece. Since 1990, however, JOE’S GARAGE has been achingly out of print on vinyl… just waiting for the right time to infect the world again. The three-LP R&B/Prog/Doo-Wop/Reggae/Jazz/Lounge/Rock Opera takes the listener on a journey through what Frank liked to call “a stupid little story about how the government is going to do away with music.” Once you buy into that premise, Frank and his cohorts handle the rest. With censorship stalwarts clearly in his sights, Zappa (The Central Scrutinizer) proceeds to weave the tale of a young man (Joe) with dreams of being a rock star and what can happen if you choose a career in music. From groupies to the government, the onslaught to take him (and those like him) down is unleashed. Lyrically, Frank was unapologetic about using the English language, unmolested, to convey his thoughts in the clearest and most concise way possible with his storytelling. Much of this phase of his work was used as an example for the case against the spread of explicit content in music in the coming decade, which he fought boldly against. And then there’s the music of JOE’S GARAGE. Although it’s worth noting recognizable contributions from Peter Wolf (J. Geils Band) and Dale & Terry Bozzio (Missing Persons), the spotlight manages to shine brightest on the soulful vocal styling of one Ike Willis, who is featured quite prominently throughout the record as the voice of Joe. Willis’ masterful range and gift of delivery adds a level of humanity that draws you in from the title track onward. The story traverses an avant-garde field of musical genres, taking sharp left and right turns at nearly every opportunity, making a start-to-finish spin of this album a true joy ride. In fact, one of the more interesting things to listen for is Frank’s extensive experimentation with “xenochrony” (the practice of taking previously cut live guitar solos, with different time signatures, and overdubbing them onto new studio tracks). All but two songs on this album incorporate this method, showcasing the complex nature of how the record was made. The album eventually enters cool-down mode with what many consider Frank Zappa’s most beautiful guitar solo in “Watermelon In Easter Hay”, a nine-minute epic that replicates the last imaginary guitar solo that our hero, Joe, dreams up. That track alone is a sonic wonder, but the new all-analog mastering of the 1979 ¼” safety master tapes by Bernie Grundman really brings this entire record into present day standards. Complete with a triple-gatefold package that includes all three LPs pressed to 180-gram audiophile quality vinyl, JOE’S GARAGE has finally achieved its best sounding state since its original release nearly four decades ago. Wrong Peter Wolf on Joe's Garage. It was not Peter from J. Geils.